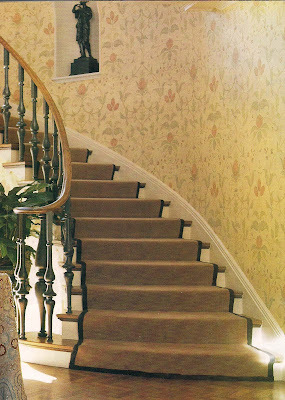 The renovated stair with a new balustrade by John Tackett Design compliments the original style of the house. 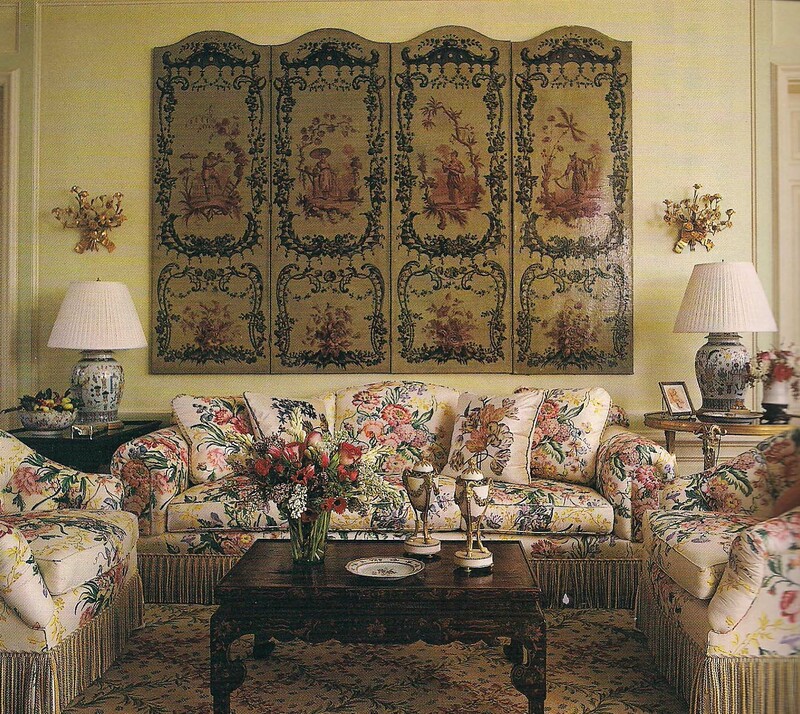 The custom stencilled decorative painting was executed by the late Robert Jackson and his crew. As a continuation of the series of posts on the house in Volk Estates, University Park, Dallas, the improvements for the main staircase in the Entrance Hall are presented here. Although the house was built in the Tudor Revival style in 1934, it had been remodelled in the 1950s with many of the original details replaced by more modern and eclectic features. The Fifties iron stair balustrade was the first thing noticed on entering the house, and it was the feature at the top of the list that the new owners were most eager to change. 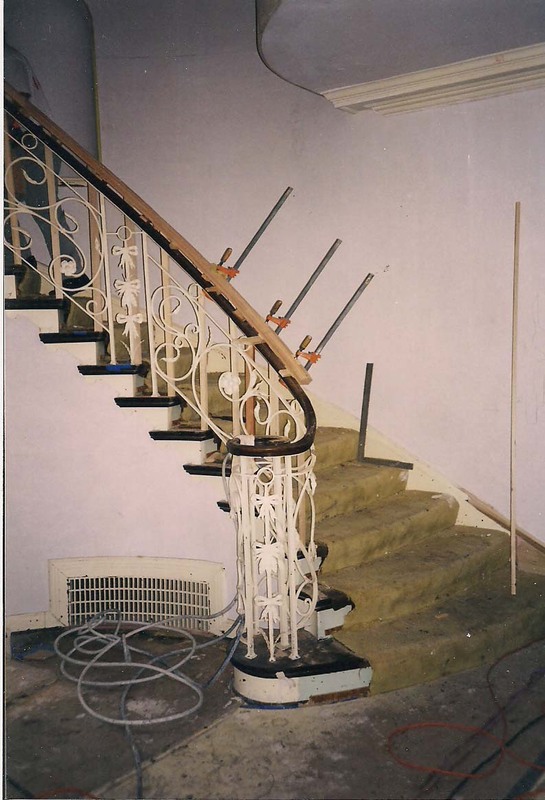 A BEFORE view of the Fifties balustrade showing the new oak handrail. Photo by John Tackett Design. New wood balusters, newel and handrail were designed to compliment the architecture and comply with safety requirements. The curve of the stairs was continued above, with the floor opening altered and a curved second floor partition added to redefine the space. 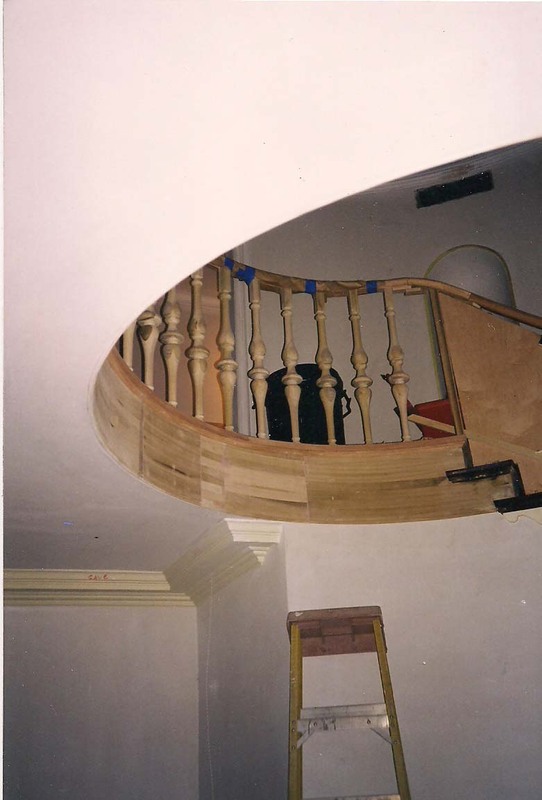 An IN PROGRESS view showing the new balustrade and the altered floor opening to continue the curve. These changes led to a reconstruction of the entrance to the second floor bedroom located above the main entrance. Although the bedroom had an attractive triple exposure, the original locations of the doors prevented a comfortable placement of furniture. The new plan proposed by John Tackett Design shown below was realized, relocating the entrance to a large walk-through closet that also provided acess to an adjacent second guest bathroom and guest bedroom (not shown). 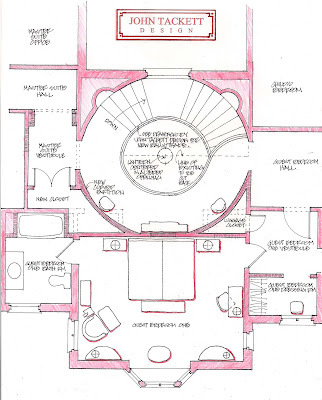 The Proposed Plan of the renovated second floor Stair Hall and the Guest Bedroom. Drawing by John Tackett Design. On the exterior, the unique original oriel window of Douglas fir, copper, and leaded glass placed against the exterior wall of random Texas fieldstone and diaper-patterned brick makes the house memorable. 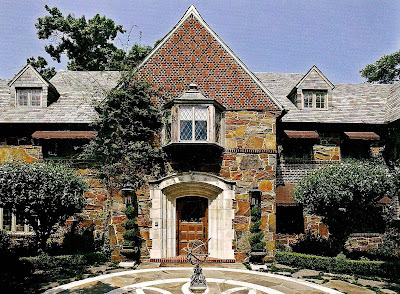 The original architect was Clyde H. Griesenbeck, noted for his picturesque Tudor manors in both University Park and adjacent Highland Park. An Exterior view of the main entrance with the Guest Bedroom above. Photo by Steve Clicque from THE HOMES OF THE PARK CITIES, DALLAS: GREAT AMERICAN SUBURBS. The 2008 book THE HOMES OF THE PARK CITIES, DALLAS: GREAT AMERICAN SUBURBS may be purchased through The Devoted Classicist Library at a discount of 37% off the published price and the option of free shipping by clicking here. Photo by Michael Mundy for Parish-Hadley. In the Horse Country of New Jersey, the area around Peapack where the owners of the beautiful old estates still insist on keeping their roads unpaved, was a very stylish house with a great room, perhaps my favorite of the Parish-Hadley living rooms done before my time there. Ornamented with classical pilasters salvaged from a local historic building, the pale gray walls and the dark-stained wood floor provided a great background for the furnishings in essentially just three fabrics: a chintz, a silk, and a cotton. Decorated in 1969, the room remained virtually untouched until the owner decided to scale down to a smaller house forty years later. 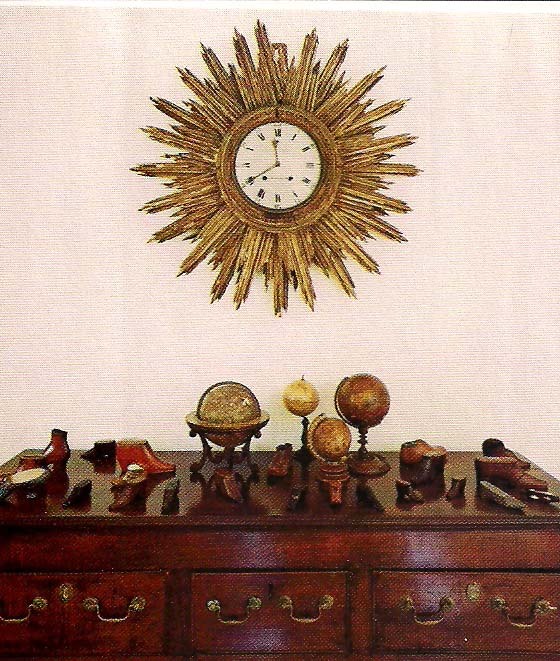 Albert Hadley was called back to edit and arrange the furnishings, one of my favorite being the giltwood starburst clock. Photo by Simon Watson for "House Beautiful". In the new house, a very simple clapboard Late Georgian dating to 1820, the two front rooms were combined to create a large living room with a fireplace at each end. The walls were painted off-white again, but this time the wood floor was painted pale gray, a custom mixed color Albert Hadley calls Fog, and again left bare. The chintz-upholstered Odom chairs were placed flanking the fireplace; the chintz had been discontinued so it was not replaced. Other seating was slipcovered or recovered, however, with the exception of the great pair of Regency benches which still remained without refreshment of the painted finish. The wooden urn lamps that had white shades when placed in front of the wallpaper screens in the former house, now have black shades to stand out at the bare windows. This room is an example of decorating small, spare and chic. And it cannot be said often enough: buy what you love and it can be used over and over again. The 1969 decoration appeared in Parish-Hadley, Sixty Years of American Design with photos of this room by Michael Mundy, and the new house with re-used furnishings was featured in the July, 2009, issue of "House Beautiful" magazine with photos by Simon Watson. The 1995 Christopher Petkanas book PARISH-HADLEY, SIXTY YEARS OF AMERICAN DESIGN is out of print, but used and collectible copies can be purchased through The Devoted Classicist Library in affiliation with Amazon by clicking here. 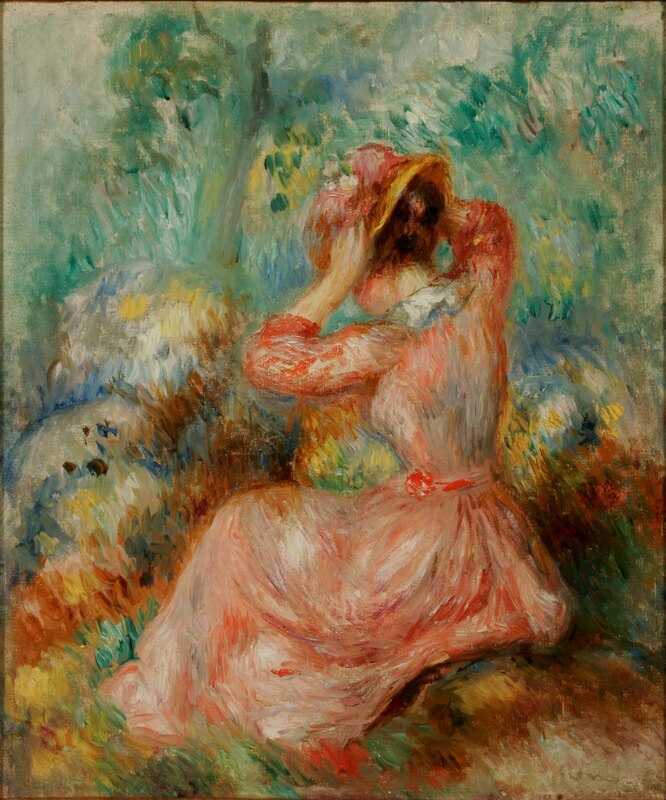 A Renoir painting currently on exhibition at the Memphis Brooks Museum of Art. Pierre-Auguste Renoir, French, 1841-1919. Woman Arranging Her Hat, ca. 1890. Oil on Canvas. High Museum of Art. Gift of Micheline and Bob Gerson. 2008.165. ﻿ Those who are able to tolerate this summer's heat in Memphis are rewarded with not one but two extraordinary exhibits of Impressionist art. These images that are now so popular and so easy-on-the-eyes were once considered not only avante garde but shocking, and eventually revolutionized the way we look at art. 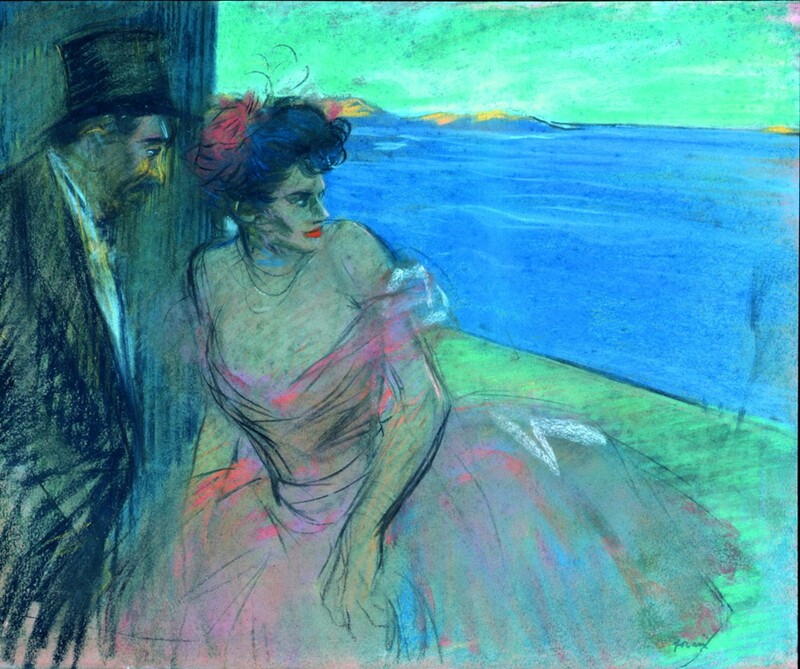 A Forain pastel on exhibit at Dixon Gallery and Gardens. Jean-Louis Forain, French, 1852-1931. In Front of the Set, ca. 1895-1900. Pastel on Paper. Collection of the Dixon Gallery and Gardens, Museum purchase with funds provided by Brenda and Lester Crain, Hyde Family Foundations, Irene and Joe Orgill and the Rose Family Foundation, 1993.7.30. 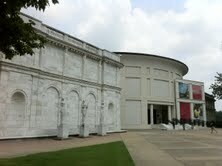 Memphis Brooks Museum of Art, with the original building by James Gamble Rogers on the left. Photo by John J Tackett for The Devoted Classicist. Regular readers of The Devoted Classicist will recall the essay on the original part of the Brooks Museum designed by New York Architect James Gamble Rogers featured in the May 31, 2011, post. As a special feature of this remarkable pair of exhibitions, a General Admission ticket purchased at Brooks can be presented at Dixon for free admission, and vice-versa. Brooks is closed on Mondays and Tuesdays, but Wednesdays are Pay-What-You-Can. Dixon is closed on Mondays, but Tuesdays are Pay-What-You-Can and Saturdays are free from 10 to noon. (These free admissions are corporate sponsored with private funding contributions). Dixon Gallery and Gardens, with the original house by John F Staub on the right. ﻿The original part of the Dixon is a handsome house that was designed by Tennessee-native John F. Staub, best known for his work in Houston. The Dixon residence will be featured in an up-coming essay on The Devoted Classicist. 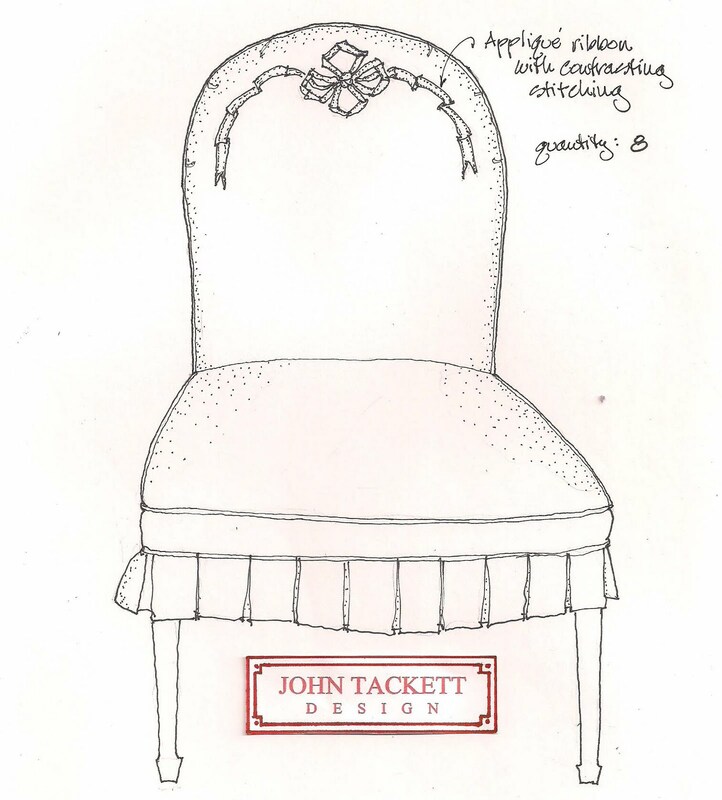 A preliminary design for the decoration of the slipcovers for the Luncheon Room chairs. A new addition to the house in Volk Estates, University Park, Dallas, that linked the main house to the existing garage contained a new Breakfast Room among other spaces. So the original Breakfast Room, a pleasant almost square space that was entered through a segmental arch opening from the vestibule to the Dining Room, was renamed the Luncheon Room. It had been decided that the upholstered Hepplewhite chairs would have linen slipcovers with a box pleat skirt to give contrast to the more formal Dining Room. 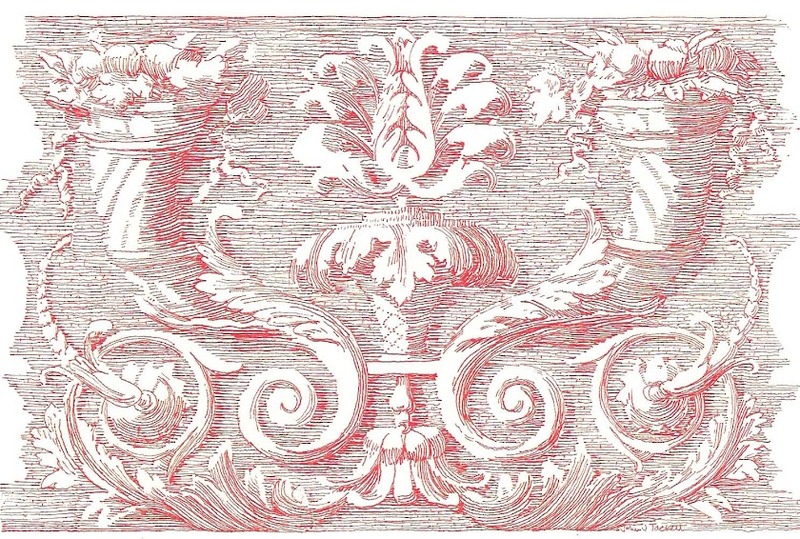 I had found a document that illustrated magnificent seventeenth century lettering that would serve as a guide for an embroidered monogram. The slipcovers had already been made and just about to be decorated when the Lady of the House attended a luncheon at a friend's home who had a new set of very similar slipcovered chairs with a monogramed back! A change of design was needed, and I proposed several variations including the one sketched above with an applique of ribbon for decoration. The slipcovers of the Luncheon Room chairs have an Etruscan motif. Photos by John Tackett Design. But when it was decided that the Luncheon Room was to be decorated with a wonderful series of prints of Roman pottery decorations and a collection of basalt porcelain, both of which my clients already owned, I switched to an Estrucsan motif for the embroidery. I drew the design full size and it was scanned into a computer that produced the machine stitching by Penn & Fletcher, a company that I had discovered through a friend who designed costumes for Broadway shows. It was just one of many touches that made this home an individual expression. 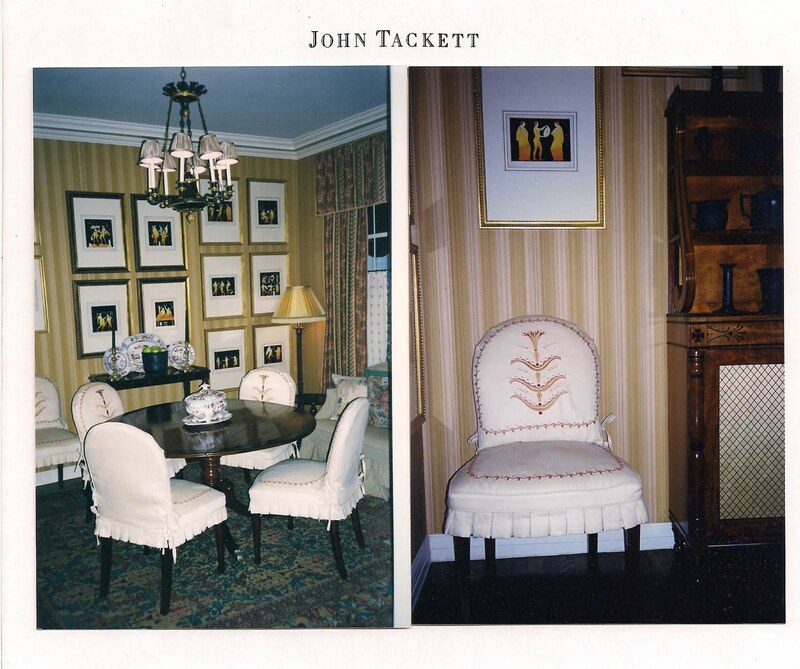 John Tackett Design provided the Etruscan motif for the Luncheon Room slipcovers. 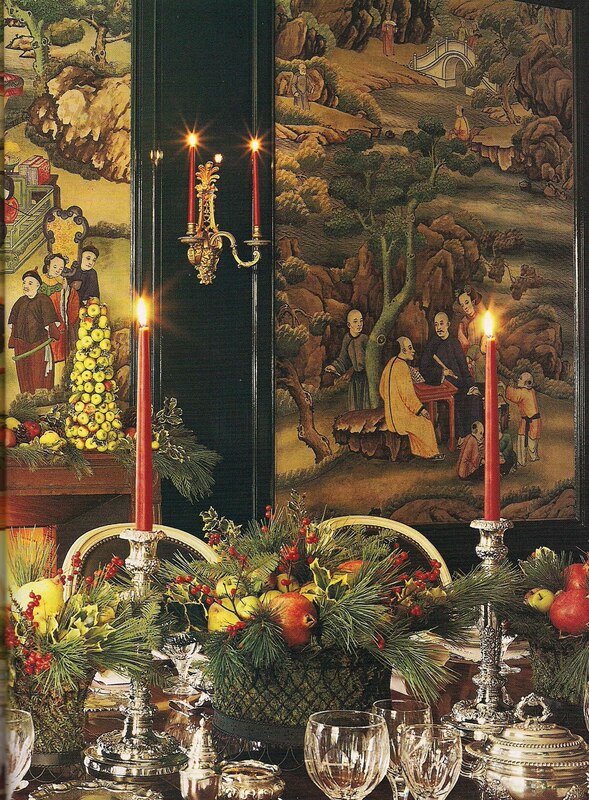 Photo of Sitting Room tabletop detail by Pieter Estersohn. 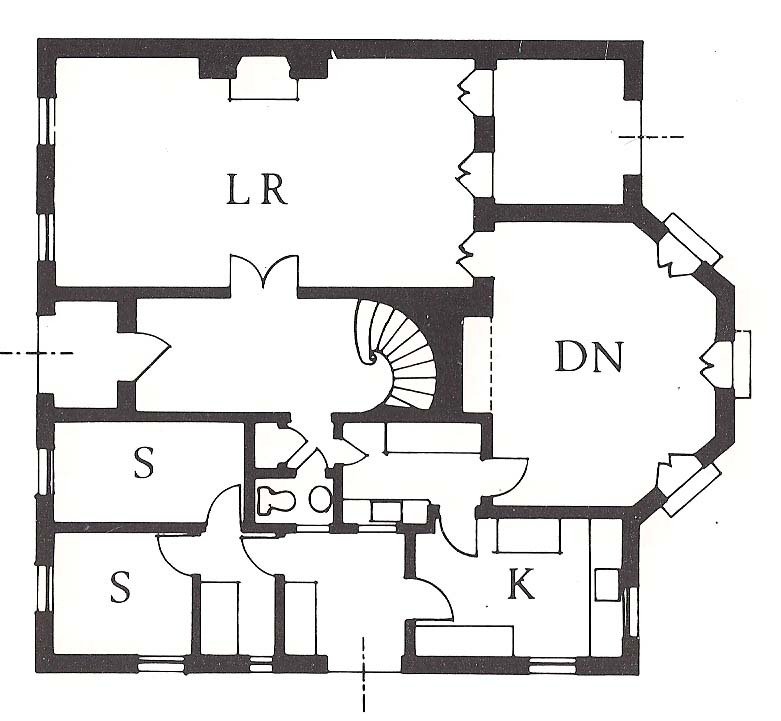 A friend who is a regular reader of The Devoted Classicist asked if I could show the floor plan of the Living Room featured in the previous post. 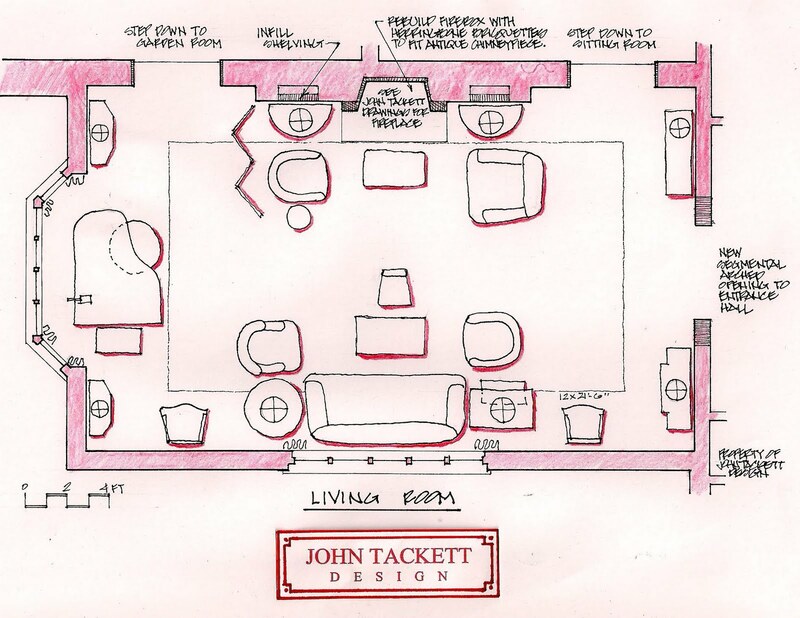 Normally, I would not for the sake of privacy, but since the photographs had appeared in Southern Accents magazine and my clients no longer live there, I am showing the furniture plan for purposes of education and record. To fill out the post, I am including a couple of shots of the adjacent Sitting Room as well. One thing about Southern Accents that I never cared for was the amount of coverage given to the "artsy" shots for which the magazine became notorious. It would be interesting to know the number of times that a magnolia blossom was featured. So now I am guilty of the same mis-use, including the first photo simply because it satisfies the Blogger template for thumbnails! Please forgive my editorial lapse in judgement. The Sitting Room photographed by Pieter Estersohn. This Sitting Room, a step down from the Living Room and looking out to the west over the deep extent of gardens, was a much-admired space. 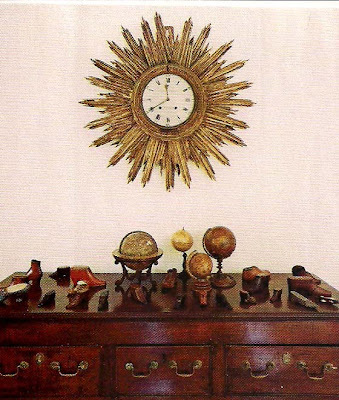 The office of Josie McCarthy is responsible for the interior design here and none of the contributions by John Tackett Design are visible in the photo. The sofa fabric by Colefax & Fowler is one of my favorites, however. The floor plan of the Living Room featured in the previous post with the folding screen is shown here. It is a proposed plan that was changed slightly for the final appearance that appeared in the Southern Accents magazine article. The main difference is that the floor was covered with a patterned sisal wall to wall with antique oriental rugs added on top, a very effective scheme that added charm and helped prevent the room from being stuffy or pretentious. 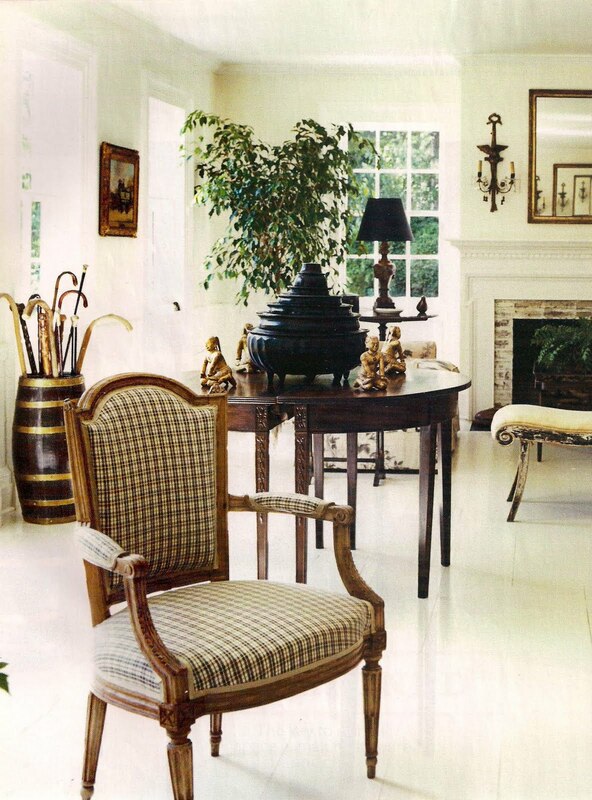 And the coordinating antique rugs in the adjacent Entrance Hall and Sitting Room helped visually link those spaces. Normally, the Living Room would have to accomodate enough seating to match the Dining Room, but that requirement was eased here because of the adjacent Sitting Room, Garden Room, and Library beyond. A view of the Living Room of a Volk Estates house renovated by John Tackett Design. Photo by Pieter Estersohn for "Southern Accents" magazine. As a continuation of The Travellers, a series where the same furnishings are shown used in different ways in different locations, this edition illustrates a folding screen. 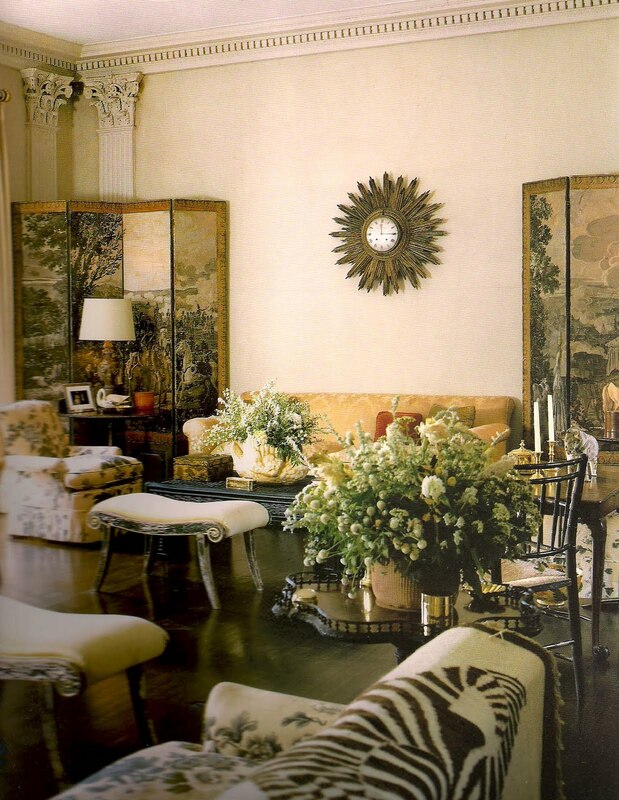 In its traditional placement to define a seating group adjacent to a doorway or as a wall hanging, a folding screen can be a huge asset to a classic interior. 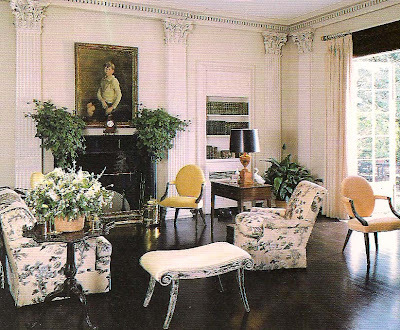 The clients' Living Room in their former home, decorated by Josie McCarthy. Photo by Peter Woloszynski for "Southern Accents" magazine. This is also a continuation of the previous July 8, 2011, post where most of the furnishings from the clients' former residence on Strait Lane were re-used at their newly renovated home on Vassar Avenue in the Volk Estates area of University Park, Dallas, Texas. The Garden Room is down a step through the thick doorway past the screen in the first photo. 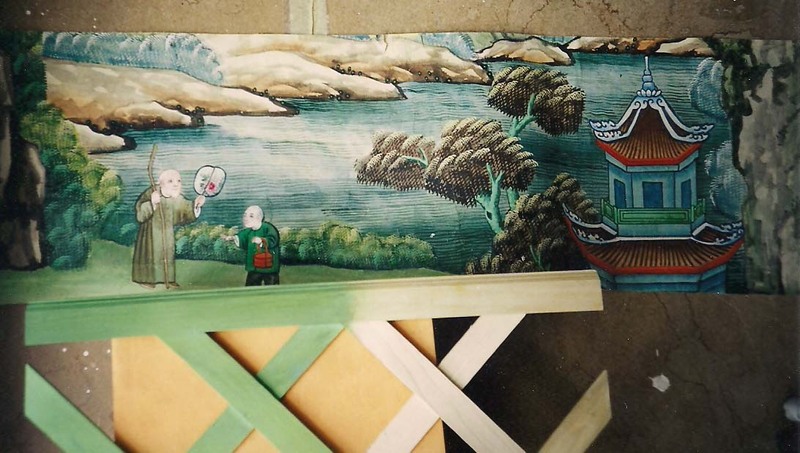 For this new placement, the back of the screen was upholstered with a check fabric and decorated with framed miniatures attached to lengths of gros grain ribbon. It is always a good investment to buy what you love, especially a versatile piece that can be used in a variety of ways. The Garden Room of a house in the Volk Estates section of University Park, Dallas, Texas, renovated by John Tackett Design. 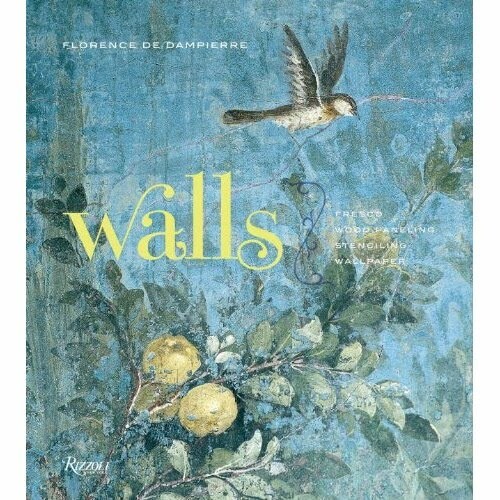 A number of blogs, including two of my favorites, The Peak of Chic and Me & Mrs. Jones, have featured the latest book by Florence de Dampierre, Walls: The Best of Decorative Treatments which was published by Rizzoli this past March. 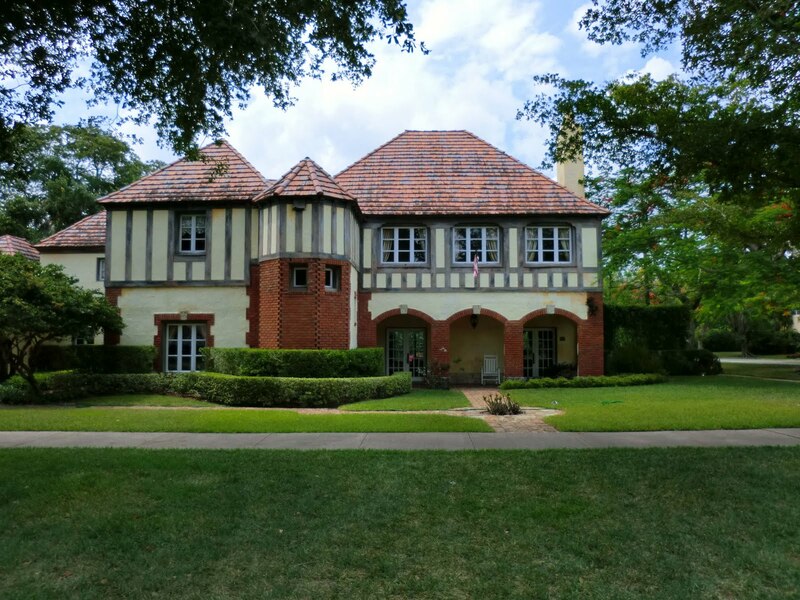 I was delighted to learn that a room from one of my projects, an extensive renovation of a 1920s house in the Volk Estates area of University Park, Dallas, Texas was featured. The book is a little "lite" in text, however, and no identification is given for the room, a peeve that has now moved to the top of my list of Issues With Authors of Design Books. But The Devoted Classicist is happy to be able to provide more information on the room. The wallpaper panels as installed in the Dining Room of the owners' previous home, with interior design by Josie McCarthy. 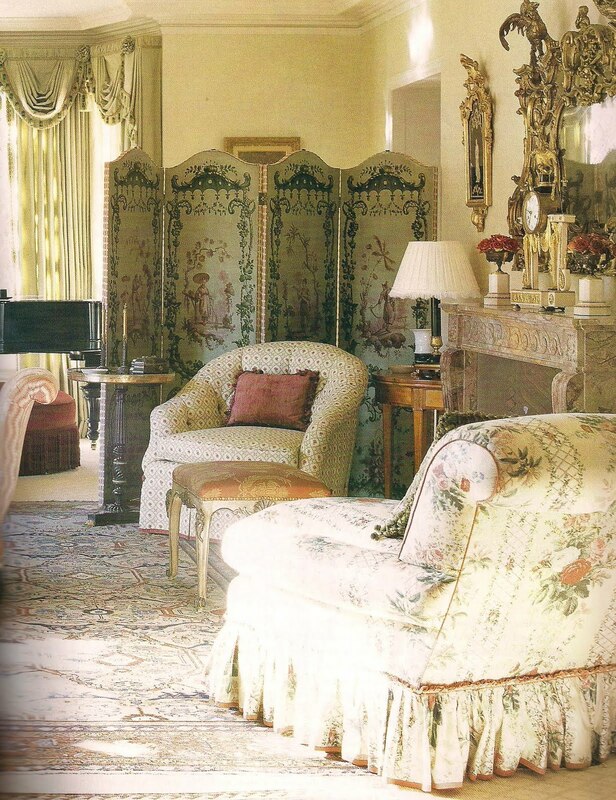 The eighteenth century handpainted wallpaper panels were bought by my clients some years before, and installed in the previous home's Dining Room which was arranged with mouldings in a boiserie effect of black lacquer walls. But the owners wanted to use them differently in their new residence. The trio of custom made stools resulted from a 1996 series of velvet covered furniture developed by John Tackett Design. The space was previously a Florida Room with jalousie windows of glass louvers and a shag carpet over the concrete floor. With the addition of a new panelled Library on the ground floor, this room became a passage from the adjacent Living Room on one side and a cozy Sitting Room on another, making it essential to create a distinctive space as well as a link to the remarkable garden beyond. 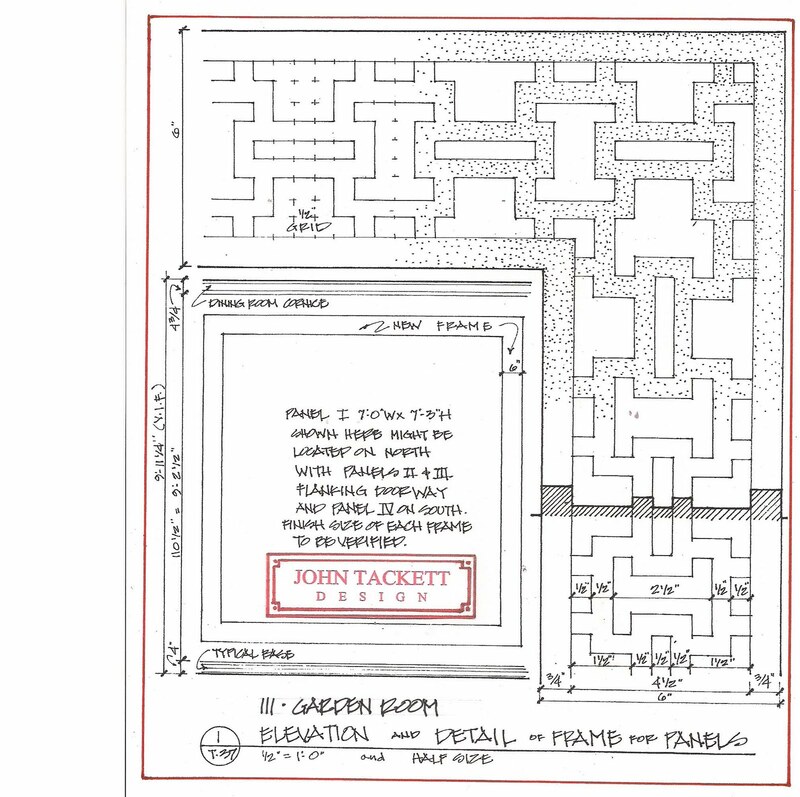 Drawing by John J. Tackett from construction documents by John Tackett Design. The six panels were the same length, but of different widths. The layout of both the room and the panels allowed them to be joined as a large panel on the north and south walls but kept separate to flank a doorway on the east wall. A design module was devised to allow a fretwork frame that would fit the four resulting widths yet still allow for corners to be resolved. 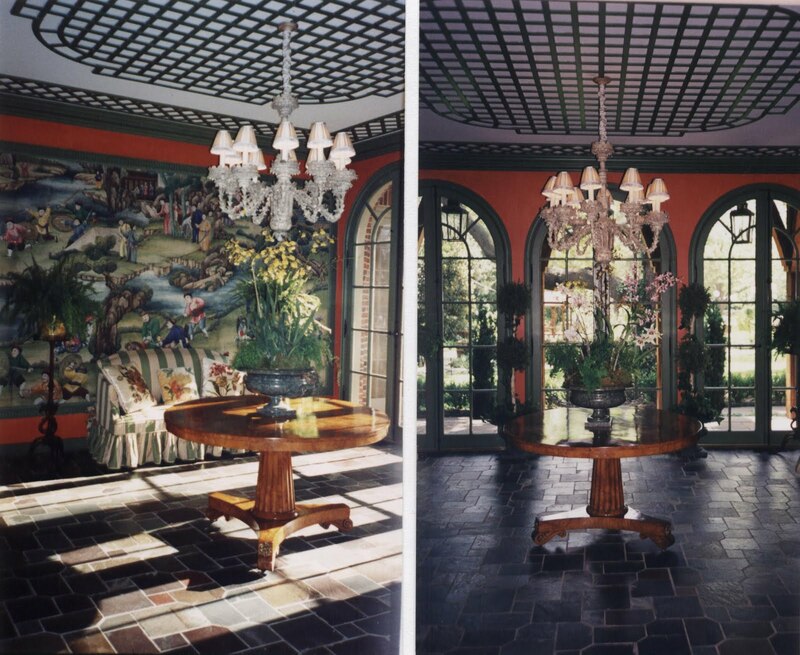 Views of the Garden Room showing the south and west elevations showing the treillage added to the ceiling and the antique tole chandelier from Marvin Alexander, Inc. The slipcovered loveseat was relocated for the previous images. Photos by John J. Tackett, John Tackett Design. To reinforce the garden theme, a traditional lattice motif was introduced but restricted to the ceiling. Roofing slates were used for the new flooring and custom French doors open to a new porch. A scap of the wallpaper from the previous installation was used to develop the paint scheme for the Garden Room. Photo by John J. Tackett. 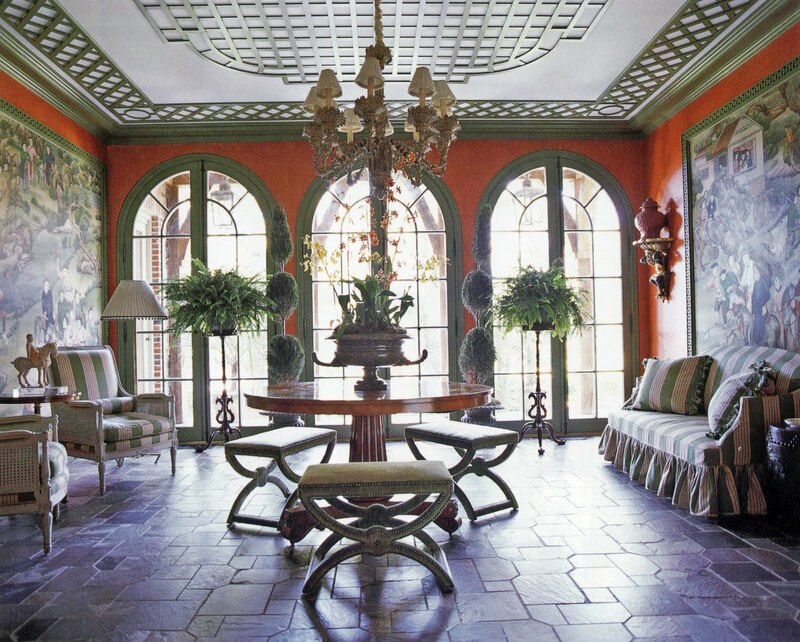 The paint scheme for the room was developed on site with the owner and the painter, Barry Martin, who used pigments to mix the colors for review and approval. The furnishings were a collaboration with Josie McCarthy, who had designed the interiors of the clients' former home. An admirable job was done by the building contractor Kevin Smith, and Wilson Fuqua provided the documentation for Code Compliance. 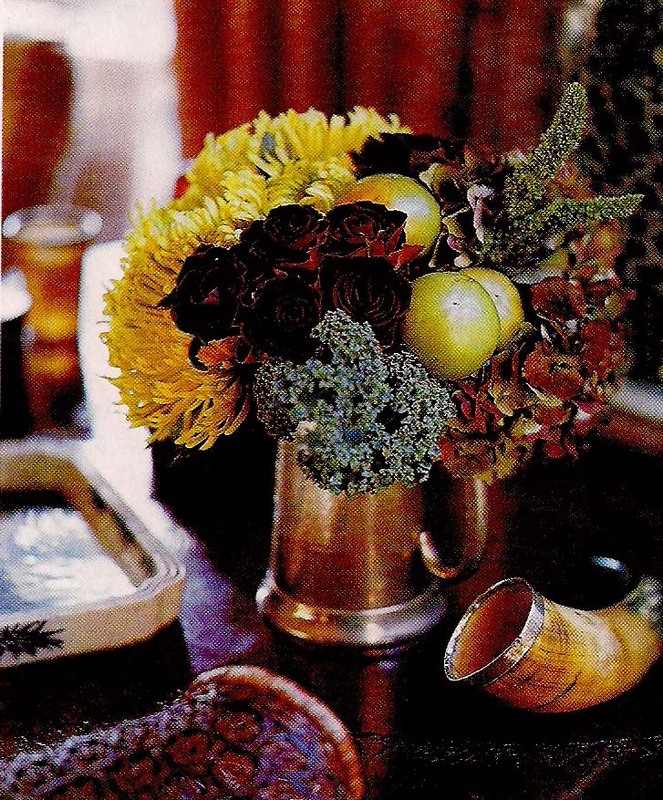 The 1999 Pieter Estersohn photos originally appeared in a fourteen page article in "Southern Accents" magazine in 2001. 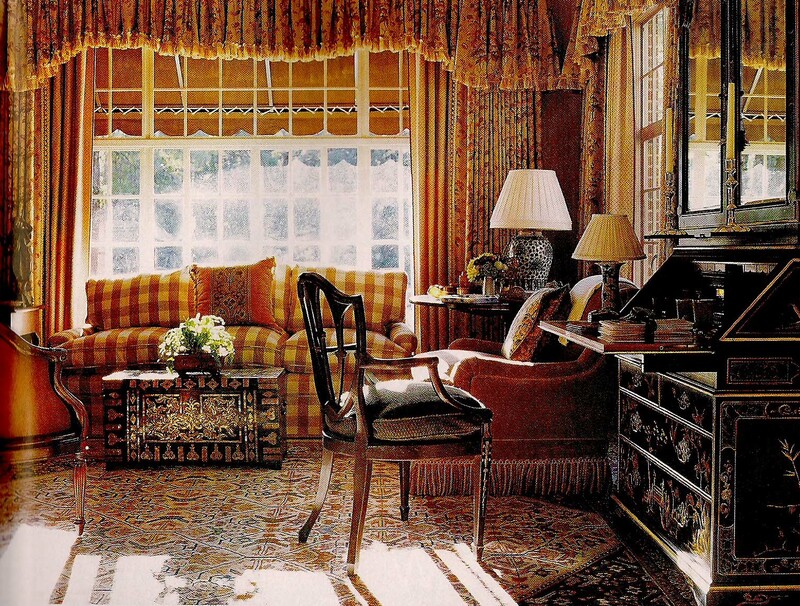 Some photos of the house also appeared in the 2003 book Southern Accents on Color edited by Frances McDougall. My clients have since sold the house, now spending more time at another project I designed for them in Pebble Beach, California. But additional aspects of this Vassar Avenue house will be featured in future posts of The Devoted Classicist. 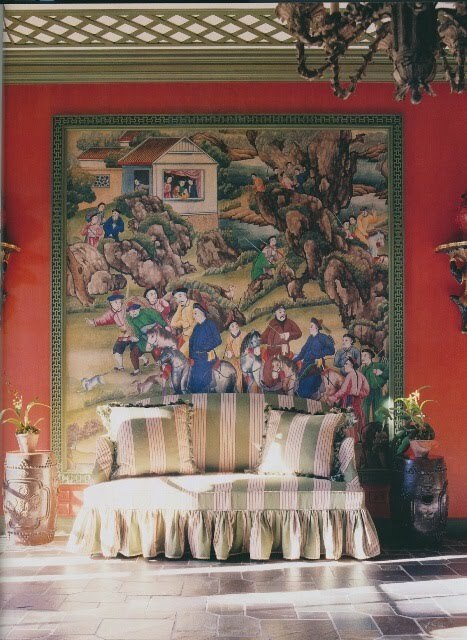 The 2011 book WALLS: THE BEST OF DECORATIVE TREATMENTS can be ordered at a discount of 30% off the published price with the option of free shipping by clicking here to visit The Devoted Classicist Library. The "Gate House" garden pavillion, 1033 Hardee Road, Coral Gables. Photo: John J Tackett for The Devoted Classicist blog. 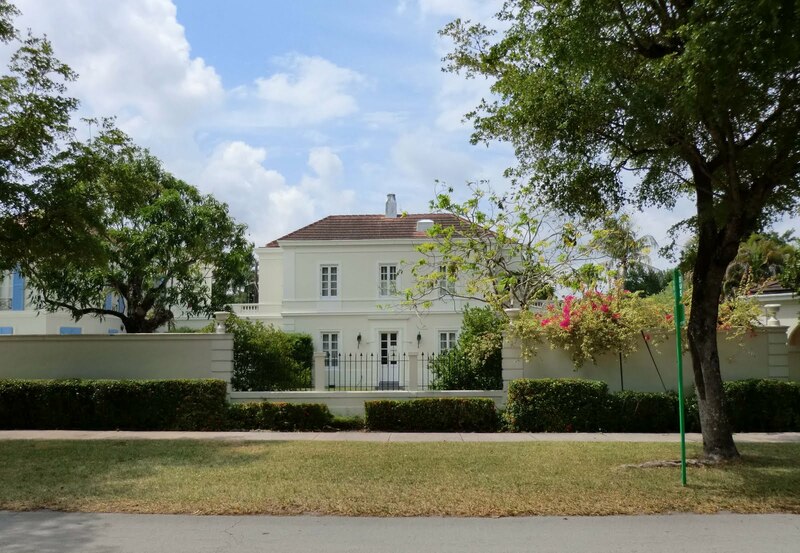 The Devoted Classicist cannot move on without presenting one more of the many fabulous historic aspects of Coral Gables, Florida. As mentioned in the previous post on Venetian Pool, George Merrick began to realize his City Beautiful vision of a Mediterranean style community in 1921 with the help of a team of architects, artists, and landscape architects. Merrick relinquished some control, however, in 1925 by deeding over 100 building lots to the American Building Corporation, and investment group based in Cincinnati, Ohio, and former Ohio Governor Myers Cooper. A series of as many as twenty period revival theme villages were considered with a thousand residences. But fewer than 80 were ultimately constructed in six villages. The 1926 hurricane and the depression that followed ended Merrick's dream and, heavily in debt, he was removed from the Coral Gables commission. 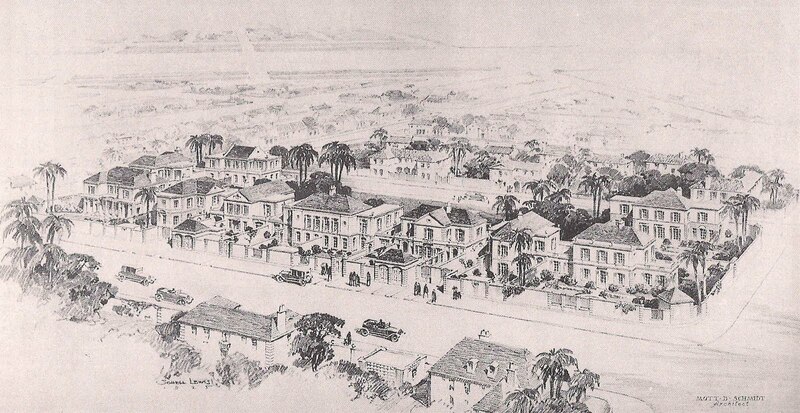 A perspective rendering of French City Village, Coral Gables, by Schell Lewis, 1925. Drawing: THE ARCHITECT, December, 1925. My favorite is the French City Village designed by Mott Schmidt because it is such a successful semi-urban enclave. Schmidt partnered with Anderson Fowler, a New Jersey developer and attorney, to create a contiguous but slightly varied group of small classical villas will walled gardens and garages in an interpretation of the eighteenth century French style. Block plan of French City Village, Coral Gables, Florida, from the original working drawings. Drawing: Mark Alan Hewitt, from THE ARCHITECTURE OF MOTT B SCHMIDT. Construction photo of French City VIllage, circa 1926, showing the intersection of Leonardo Street and Hardee Road. from THE ARCHITECTURE OF MOTT B SCHMIDT. Consisting of a total of eleven original lots on a block bordered by Hardee Road on the south, Cellini on the east, Cotorro on the north, and Leonardo on the west, the houses form a desirable grouping that anticipated the "townhouse" developments that started becoming popular forty years later. The corner garden pavilions which appear as gate houses are an especially nice touch. The intersection of Hardee Road and Cellini is shown in this circa 1926 construction photo of French City Village, Coral Gables. New houses in a sympathetic design have now filled in the remaining lots, except for 1042 Cotorro Avenue; it is listed for sale for $790,000 and includes a design for a small villa in the same style of the neighboring houses. 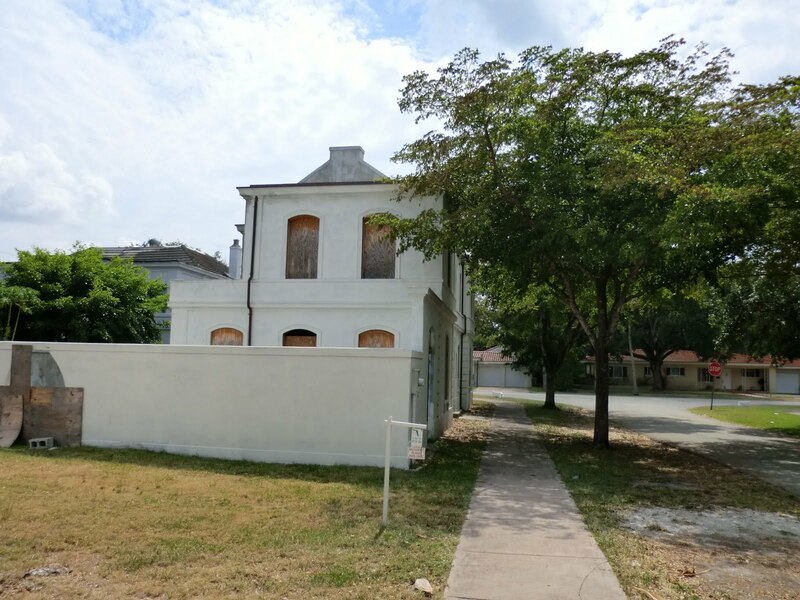 The east end of 1032 Cotorro is shown with the vacant lot at 1042. 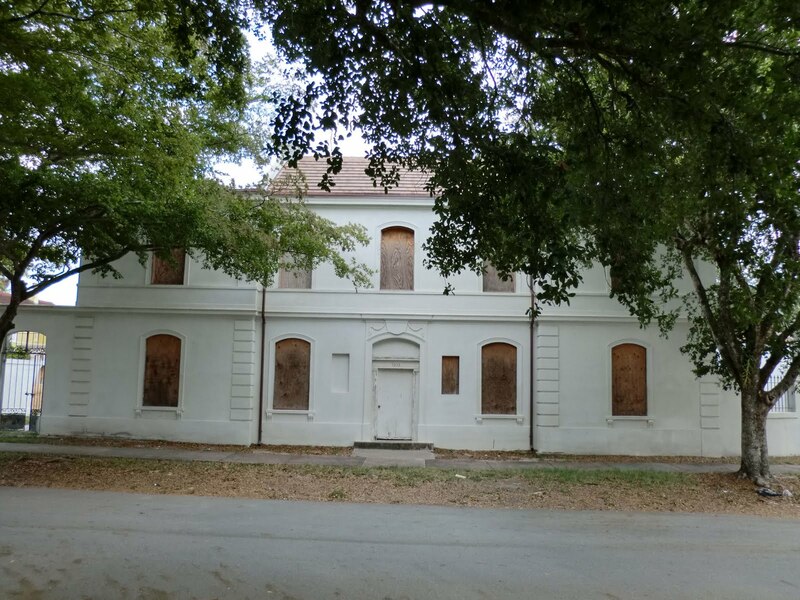 The Devoted Classicist is enamored of the abandoned shell at 1032 Cotorro at the intersection with Leonardo Street. (Early readers of this blog might recall some coincidental similarities to the new house by John Tackett Design featured in the December 19, 2010, post of The Devoted Classicist). The classic proportions and siting so close to the sidewalk are noteworthy; despite the current condition, it is a wonderful semi-urban house. The real estate ad notes that it is a Short Sale, subject to bank approval; the listed price is $1,550,000 as is. 1032 Cotorro at the intersection with Leonardo Street. 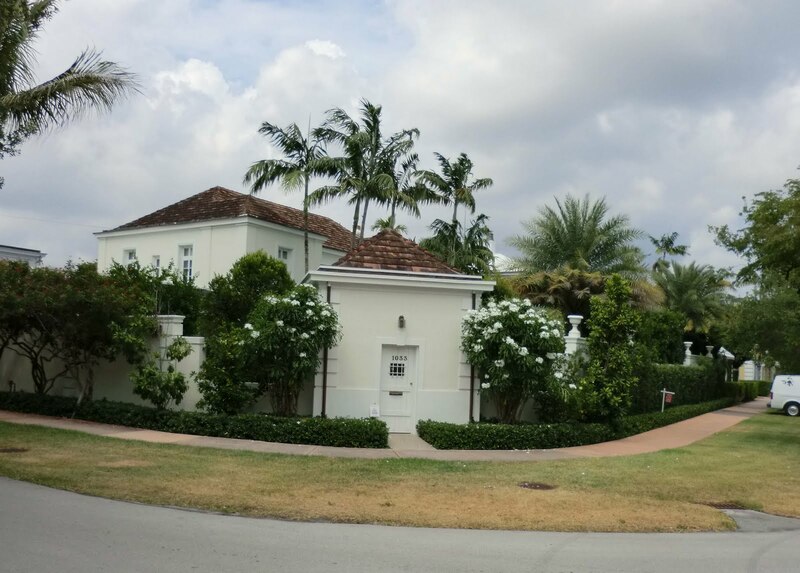 The house at the corner of Hardee and Leonardo, 1033 Hardee Road is listed for sale at $2,495,000. (See the July 4, 2011, post of My Little Housing Blog, linked in the Blog Roll on the right margin of this page, for more photos). And 1013 Hardee is listed for $1,095,000. More information on these property listings can be found by a Google search of the address. A view along Leornardo Street showing No. 6105 on the left, and 1033 Hardee on the right. 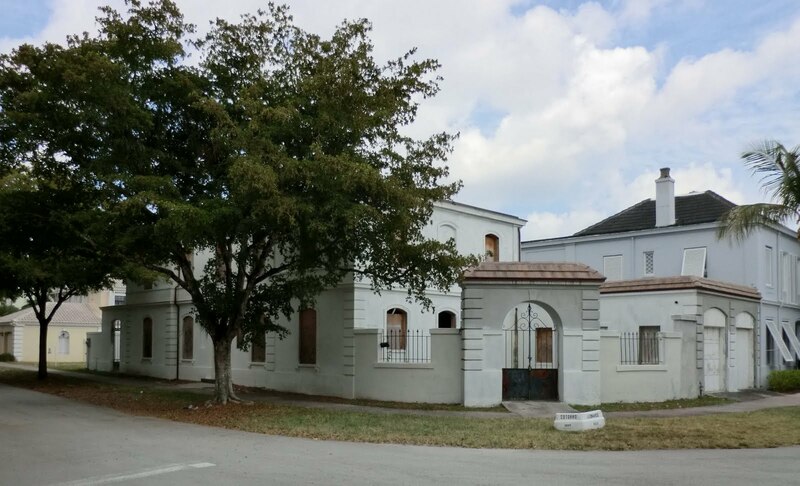 1013 and 1009 Hardee Road, Coral Gables. 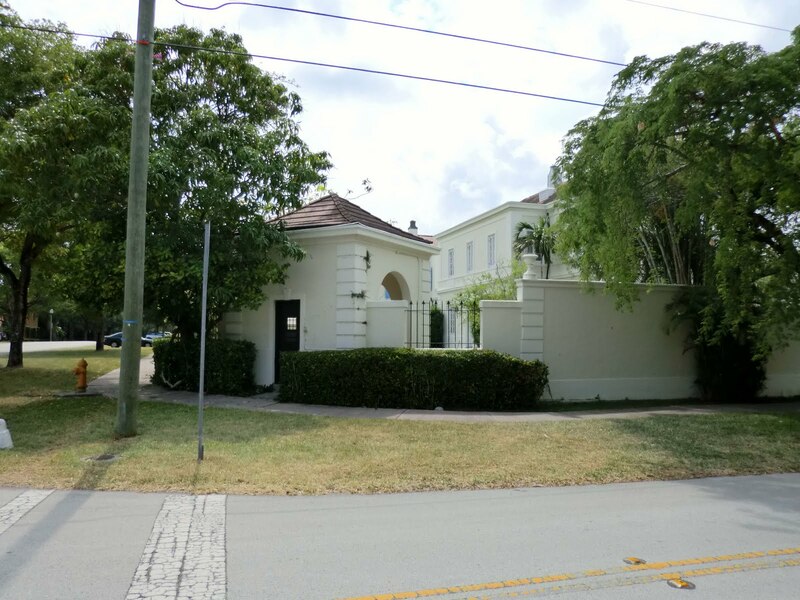 1025 and 1021 Hardee Road, Coral Gables. 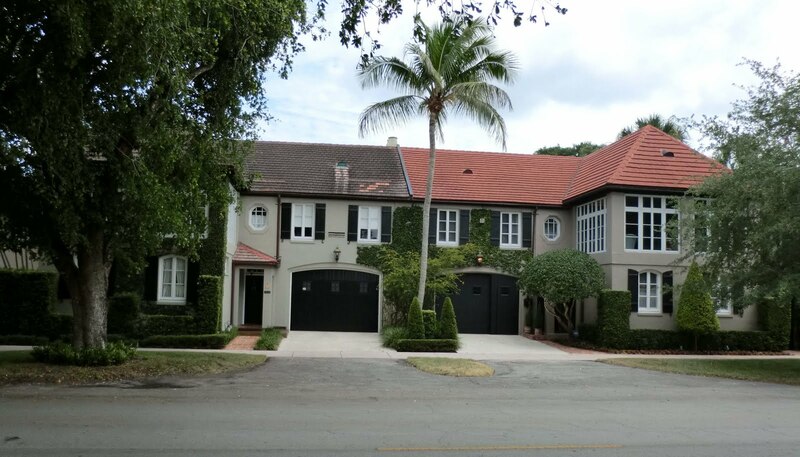 1001 Hardee Road, Coral Gables. 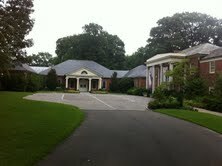 The "Gate House" garden pavillion at 1001 Hardee Road. The ground floor plan of 6105 Leonardo Street. Drawing: Mark Alan Hewitt, THE ARCHITECTURE OF MOTT B SCHMIDT. The ground floor plan of 1013 Hardee Road. Note: the scale is not the same for these two plans. 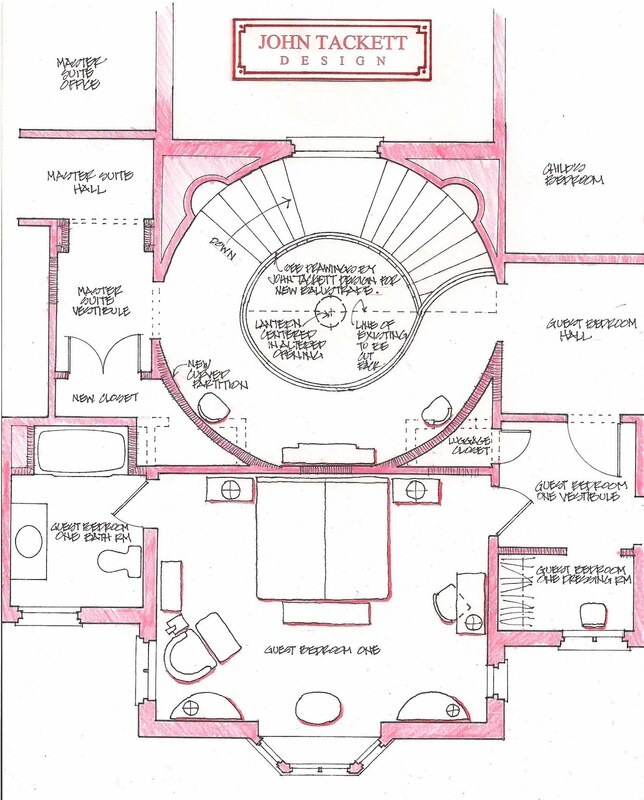 The floor plans of the huoses are variations of a common theme. 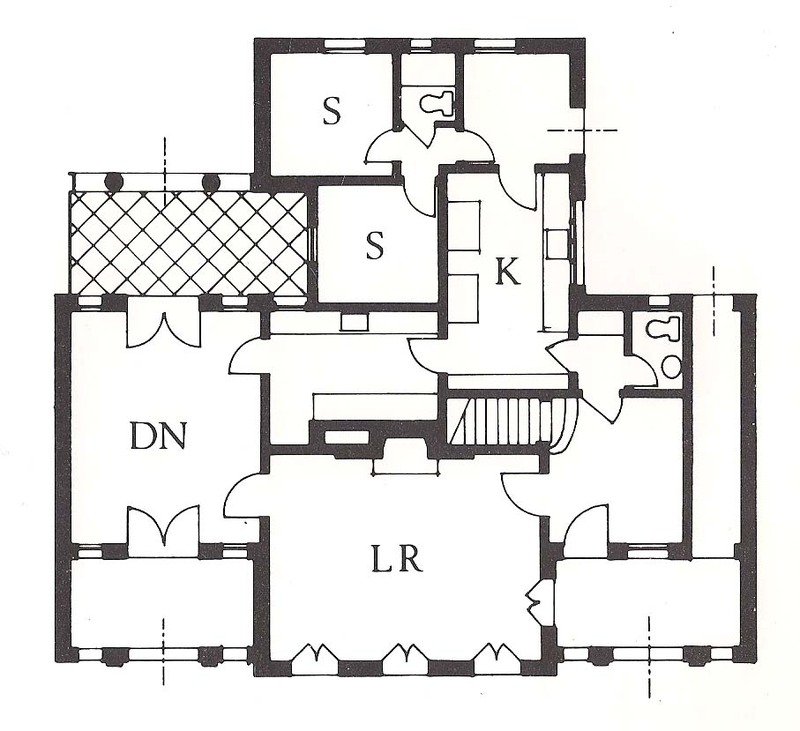 They all were designed with the ground floor to have an entrance hall with stairs, an adjacent vestibule with coat closet and powder room, a living room with a fireplace, a dining room, a serving pantry, a service porch, at least one small porch suitable for entertaining, and two servant's rooms sharing a bath.﻿﻿ No second floor plans were available, but the original scheme was smaller than the ground floor footprint; my guess is that there were usually three bedrooms and two baths upstairs. 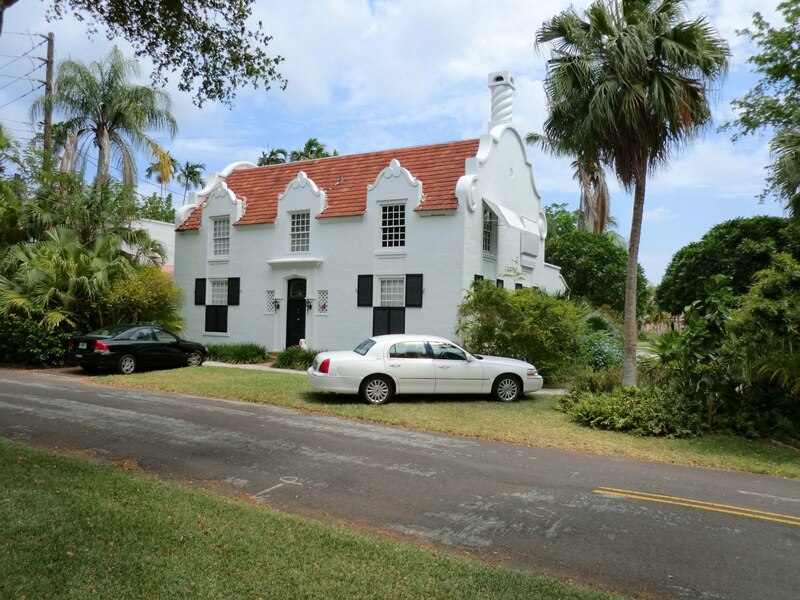 An original single house in French Provincial Village, Coral Gables at 501 Hardee Road. 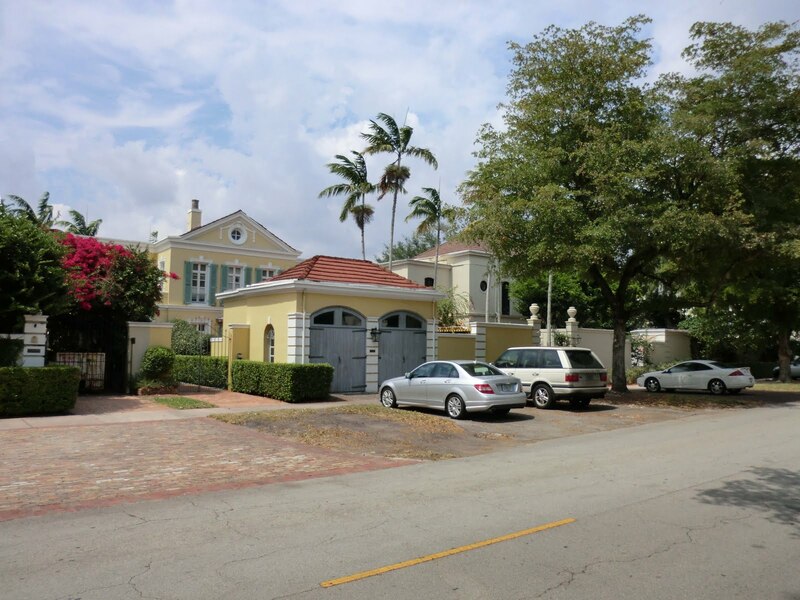 An original double house in French Provincial Village, Coral Gables, 516 - 520 Hardee Road. 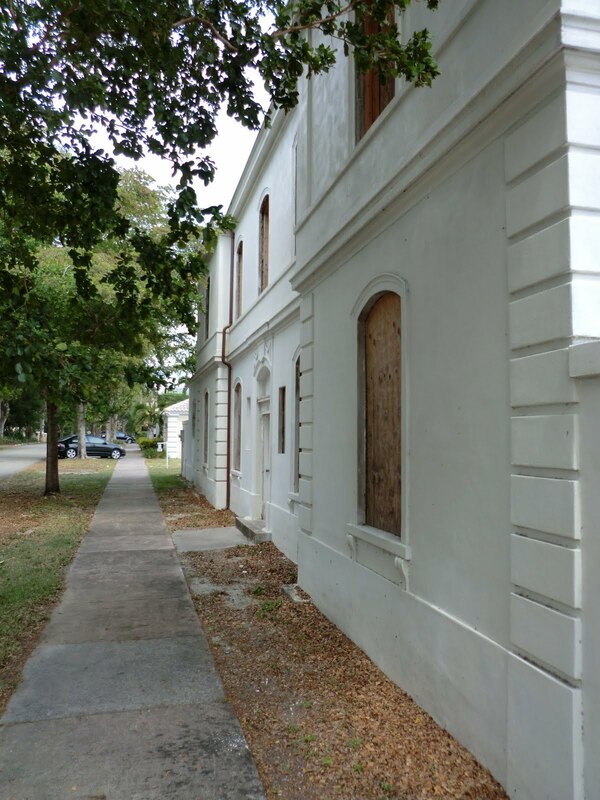 Nearby, Phillip Lippincott Goodwin was the architect of the French Provincial Village. It has some charming houses, but the development lacks the cohesive quality that helps make Schmidt's block so successful. Goodwin teamed with Henry Killam Murphy to co-author the 1924 book French Provincial Architecture which proved to be an inspiration for houses around the country. 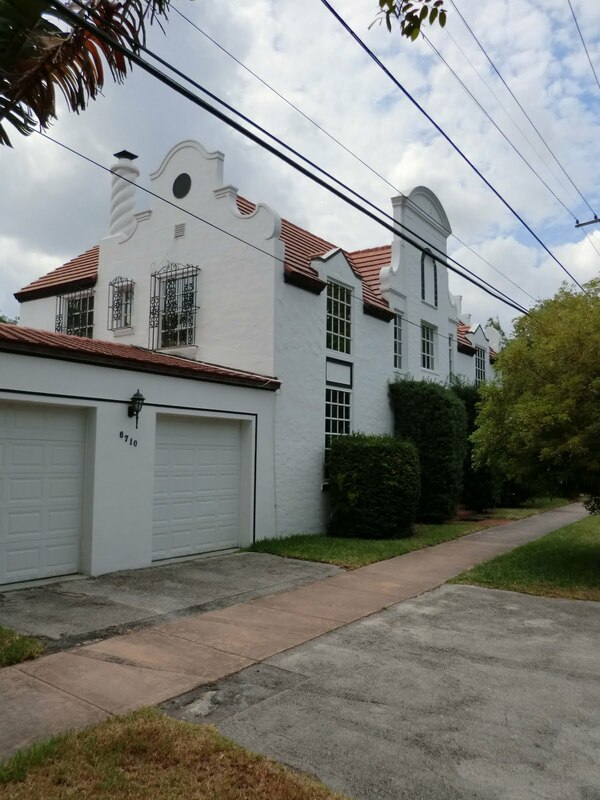 Murphy designed a development in Coral Gables as well; his Chinese Village is surely one of the most exotic examples of 1920s residential architecture in the whole country. 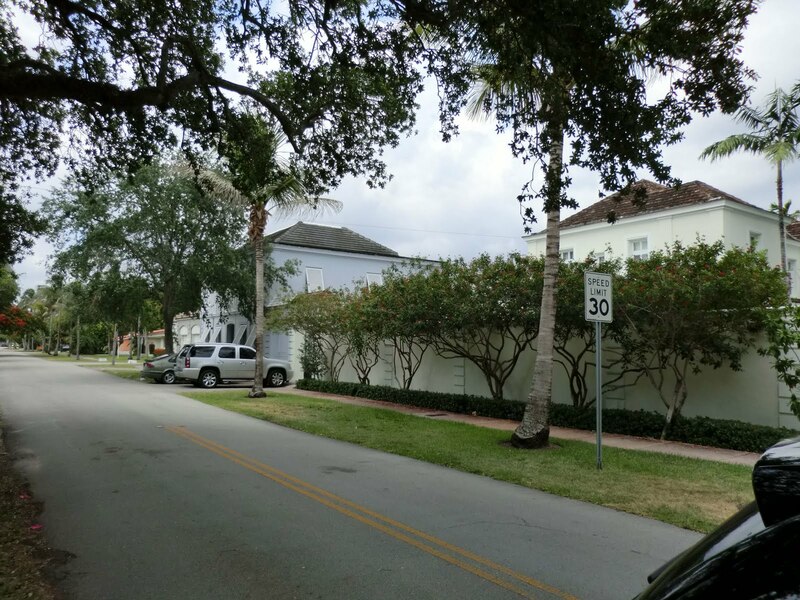 The Chinese Village, Coral Gables, San Sovino Avenue at Maggiore Street. The other unique development that sparks my imagination is the Dutch South African Village by architect Marion Syms Wyeth. 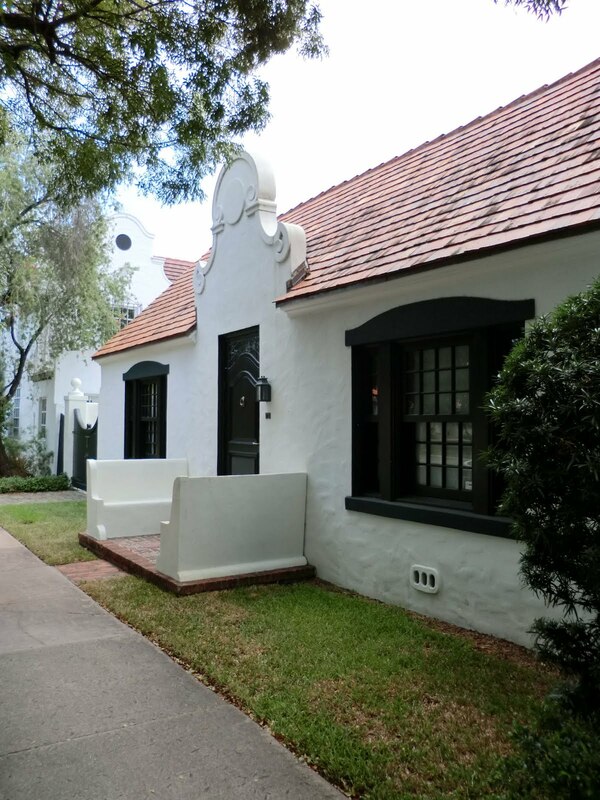 The white stucco walls, shaped gables, and twisted column chimneys are delightful. 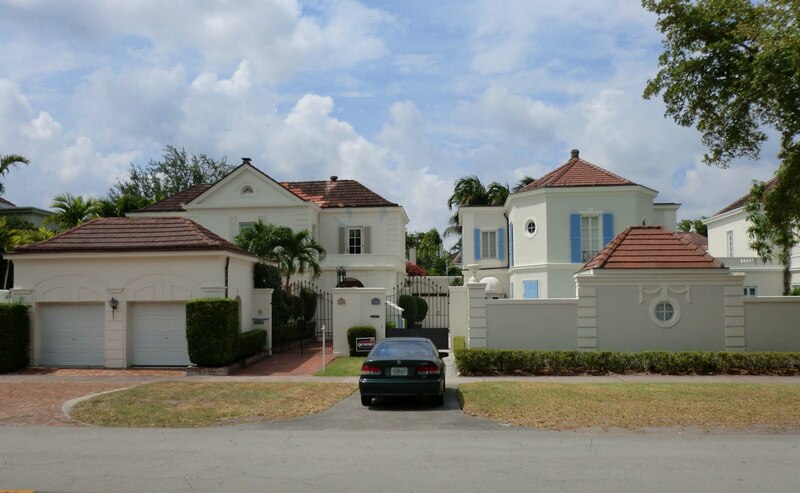 6704 So Le Jeune Road, Coral Gables, Dutch South African Village. A view from Maya Avenue of 6705 San Vicente Street, Dutch South African Village. 6776 South Le Jeune Road (SW 42nd Avenue), Dutch South African Village. ﻿﻿All these unique homes are cherished today and any proposed renovation must keep the integrity of the original design. The City of Coral Gables Historic Committee reviews all plans for the required approvals prior to issuing permits for construction. For more information on the architect Mott Schmidt, see The Architecture of Mott B Schmidt by Mark Alan Hewitt, the source for the measured drawings and historic photos shown in this post. It was published by Rizzoli in 1991. A special thanks to Ian MacDougald for his expert navigation and driving in taking The Devoted Classicist to these locations.